I can’t in good faith leave the month of March without sharing a hot tip for capping off your annual ‘Get-the-Ole-Bod-Ready-for-Spring’ prep. Before you groan, let me assure you that the particular detox activity I’m going to recommend is so absolutely pleasurable that I’m determined to repeat it at least once a month. We need to be more disciplined! Could I be venturing into masochism? I’ll let you judge. 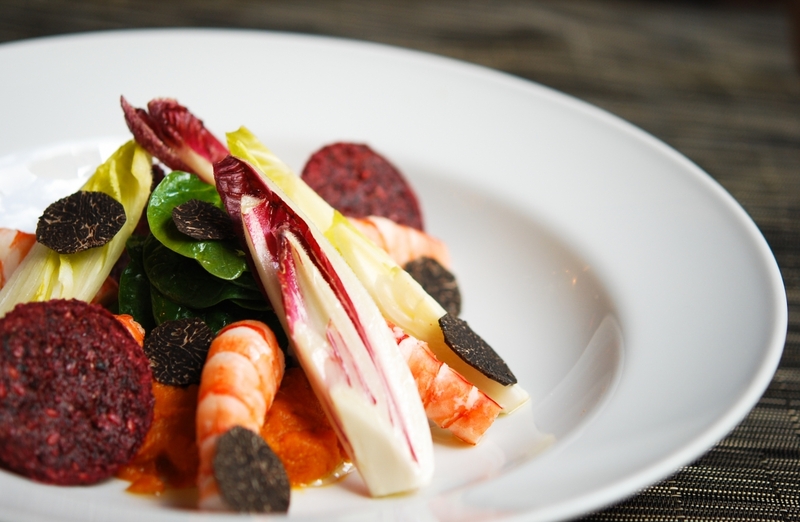 What I’m talking about is the delicious and healthy detox ‘My Blend Salad’ at the hotel Le Royal Monceau – Raffles Paris. My dynamic (and so caring for women and people) friend, Dr. Olivier Courtin-Clarins, general manager of the Clarins Group, is also founder of My Blend, a luxurious, bespoke skincare brand, and its associated spa brand, Spa My Blend by Clarins. Olivier (notice the ‘Dr’ before his name) is quick to emphasize that exquisite skin must be tended and nourished from the inside as well as the outside. For this reason, all Spa My Blend by Clarins, include beautifully functional workout rooms with fitness and wellbeing coaches, in addition to the luxurious Spa My Blend by Clarins treatments now legendary among discerning clients. Taking the inside-to-out concept one step further, Olivier recently co-create the ‘My Blend Salad’ with Executive Chef Laurent André, of the Royal Monceau’s Long Bar restaurant. A unique concept, the ‘My Blend Salad’ uses seasonal ingredients that reflect the products used in Spa My Blend by Clarins treatments and products. Working from the same premise, Olivier and Laurent also created ‘The Buffet Breakfast’, a detox option for the early risers among you (served in another of the hotel’s restaurants, La Cuisine). Since late February, Le Royal Monceau – Raffles Paris hotel has begun serving both breakfast and lunch detox options. I boldly ventured into my first experience of the ‘My Blend Salad’ (accompanied by a girlfriend – moral support is essential for these things) one chilly February lunch-time. The winter ‘My Blend Salad’, which included curly kale, citrus and other fruits, fresh shrimp, avocado, a subtle pumpkin purée, sprinkles of truffles, goji berries, raw spinach leaves, and dried beetroot. All this was accompanied by a delicate yet distinctive dressing containing freshly squeezed vegetable juices, and accompanied by 100% gluten free crackers that made the dish look like a work of art. Following lunch we indulged in the healing qualities of organic teas from Flower Infusions by Pascal Hamour. C and I started off our meal with a glass of Champagne. Perhaps not on the menu for Detox Purists, but we agreed that a certain respect for tradition is a hallmark of good mental heath, so while in Paris we should at least…. And I DID read somewhere that a glass of Champagne a day is excellent for our health. As the meal progressed we couldn’t resist patting ourselves on the back and agreeing that this was ample reward for past efforts (stellar and otherwise) to maintain and enhance our body and beauty capital, and encouragement for efforts to come. It happened that from the warmth and comfort of the relaxed Long Bar, we were looking out on the exquisite interior Terrace Garden where meals from all the hotel restaurants – Long Bar, La Cuisine, and II Carpaccio — can be enjoyed when the weather is appropriate. It was surely at this time that I began gathering courage for next month’s exercise. I really AM going to stick this out. If, having successfully completed the ‘My Blend Salad’ exercise, you feel confident that you are truly prepped and sufficiently in shape for a full pampering, I strongly advice you to complete the ‘My Blend Salad’ detox program by treating yourself to a Day Pass in the ethereal white paradise of the Spa My Blend by Clarins, also located in the Le Royal Monceau – Raffles Paris Hotel. Here, you can choose between two programs: Pilates + a Body Wrap OR Yoga + a Wrap, both with unlimited access to 16,000+ square feet of wellbeing, relaxation, the swimming pool, sauna, and hammam. This prescription may be habit-forming. EXCELLENT! I want to try this ASAP!